Cheesecake is one of my most favourite desserts. Topped with fresh whipping cream and fruit or drizzled with chocolate sauce, if there is cheesecake in the house I'm eating it for breakfast, lunch, and dinner. It's just too hard to resist it's siren call from the fridge, calling me to sample yet more of it's creamy goodness. A whole cheesecake feels overly indulgent to make just for myself; rich, far too large for our little family of three, but little babycakes are acceptable. Babycakes can be frozen for another day or shared with friends. 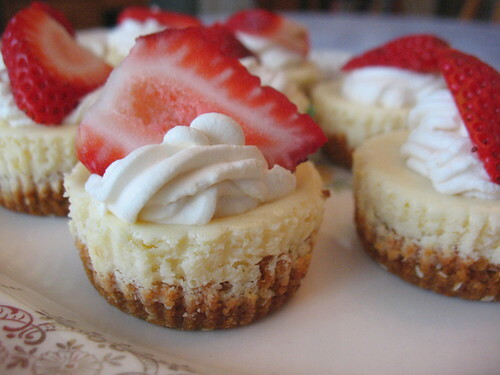 Baby cheesecakes don't seem so sinful, right? This week I turned 43 and took these little bites to work. Repeatedly people stopped me in the hall, asking (begging?) me to bring the recipe so they can make these as well because oh my, were they delicious. Be warned; if you make these, you won't be able to resist eating them all. I certainly couldn't. Pre-heat the oven to 325 F. Line two muffin tins with paper cups and set aside. In a medium sized bowl, stir together graham wafer crumbs, sesame seeds, 2 tbsp sugar, cinnamon, and melted butter with a fork until well blended. Divide the mixture among the 24 cups ( about 1 1/2 tbsp per cup) and press into the bottom. Bake the crusts 5 minutes. Using an electric mixer, beat the cream cheese and sugar until smooth. Scrape down the bowl and beat in the eggs, one at a time, until smooth. Stir in the vanilla. Beating the mixture well is important, so you don't end up with little bits of cream cheese floating around in it. Be sure to take the time and scrape down the bowl as you go, so that your filling is nice and smooth. It doesn't have to be perfect, but taking the time is worth it. Pour the filling over the warm crusts that you removed from the oven until they are about 3/4 full. Bake the filled pans for 18-20 minutes. Cool the pans on the stovetop, then gently remove the cheesecakes from the muffin tins and cool completely. Place in an airtight container and chill in the fridge for at least 3 hours. Overnight is even better because the cheesecake develops even more flavour if it has to sit for a day. Top cooled and chilled cheesecakes with whipping cream and fruit, or chocolate sauce if you wish. Store them in an airtight container in the fridge.